Ed. Note: Todays' guest blog star (and our good friend) Dr. Michael Reed knows hair care. The Manhattan-based dermatologist and hair loss expert has devoted his life to helping folks keep the locks on their heads. He's even got a new book out on the topic: Women's Hair Loss: The Hidden Epidemic. Today, Dr. Mike's taking us through the ten craziest uses for discarded locks. 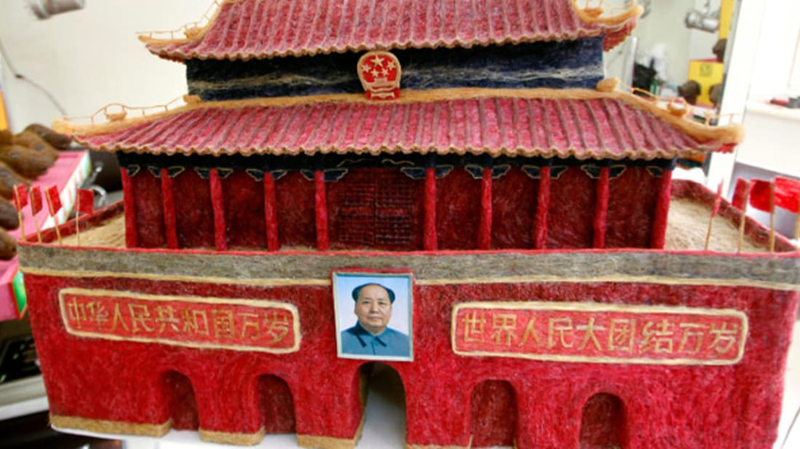 Earlier this year Beijing hairdresser Huang Xin celebrated the 60th anniversary of Communist China's founding with a replica of the buildings and monuments around Tiananmen Square "“Â all made entirely of human hair. 2. Stop an Oil Spill! Hairdresser (and hair enthusiast) Phil McCrory was watching CNN coverage on the 1989 Exxon Valdez oil spill when he noticed the fur on the Alaskan otters soaked with oil. He began testing how much oil he could collect with the hair clippings from his salon and invented the Hair Mat which helped contain an oil spill off the coast of San Francisco in 2007. Croatian designers at Artidjana Company usedÂ 165 feet of blond hair to make a dress worn by model Simona Gotovac. The outfit was featured at a fashion show in Zagreb. But Artidjiana isn't the only one. Julia Reindell one upped the designers by creating an entire fashion line made from human hair for an awards show at the Royal Academy of Art in Piccadilly. Former hairstylist-to-the-stars Ronald Thompson was cleaning hair clippings on the set of Batman Begins when he realized how sturdy a piece of hair was as opposed to fiberglass. He decided to create an eco-friendly alternative to traditional fiberglass molds andÂ designed the stiletto chair made entirely of human hair. Calling all gardeners! Need a mulching source that is renewable? Human hair makes an excellent garden mulch. In fact, Phil McCrory (of oil spill clean-up fame—what can I say, the guy loves old hair) also patented a hair mat to be used as garden mulch. In 2006 Dartmouth College commissioned Chinese artist Wenda Gu to display monument-sized banners woven entirely out of student's hair. To line their walls, the school held a hair-drive and sent 300 pounds worth of New Hampshire hair to China. Elvis Presley shaved his manly mane when he went into the service in 1958. More than five decades later those shorn locks showed up for auction to the highest bidder at Leslie Hindman Auctioneers in Chicago. The hair was apparently a gift from Presley himself to the President of his fan club, Gary Pepper. During Victorian times preserving a lock of a loved one's hair as jewelry was all the rage. A lock of hair was immortalized in a pendant and worn as a necklace or a brooch. Although this practice went out of popular fashion at the turn of the Century, some artists continue to devote their lives to hair jewelry today. If you're driving through Independence Missouri any time soon you may want to stop by Leila's Hair Museum. The walls at Leila's are adorned with artwork featuring human hair with over 400 antique hair wreaths, hatpins, necklaces, bracelets, broaches and rings all made with human hair. Additionally, Leila claims to have hair from Marilyn Monroe, Elvis Presley, George Washington, Aaron Burr, JFK and John Lennon. In 2007 an Australian baggage courier was jailed by a Melbourne judge for stealing women's hair from their suitcases. Rodney Lyle Petersen pleaded guilty to 50 counts of theft of women's hair that he collected from the baggage of Qantas passengers. Petersen would apparently pull over in his courier van and rummage through the lost or delayed luggage that he was returning to Qantas passengers. He collected hair from brushes in the suitcases and put them in plastic baggies. Be sure to check out Dr. Reed's new book: Women's Hair Loss: The Hidden Epidemic published by luxury hair care supplierÂ Lock & Mane. Click here to order, or follow the banner link below.